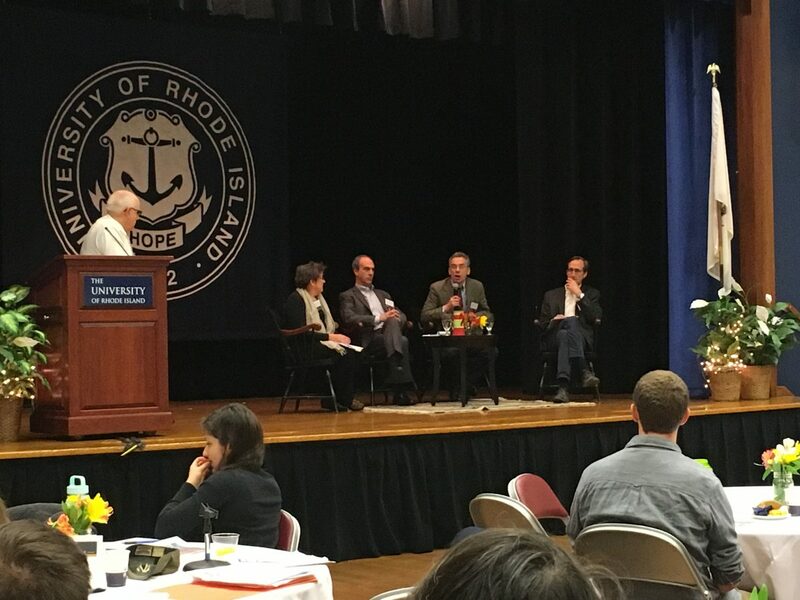 The University of Rhode Island’s AAUP hosted its first ever climate change conference last Friday, April 22. The conference, titled Climate Change Science in an Age of Misinformation, featured presentations and a panel discussion from four experts in different areas of climate change study. 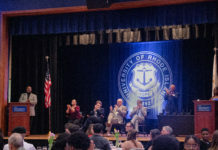 The panel discussion was followed by a keynote address from Senator Sheldon Whitehouse (D) and breakout sessions covering topics like Communicating Climate Science, Environmental Justice and Activism, and Impacts to Coastal Rhode Island. While all the presenters had different perspectives on climate change misinformation, they all had one resounding conclusion: climate change is real, and we can’t escape the consequences. McIntire explained that “scientists by nature are skeptics” as they view the facts laid out in front of them, and then challenge the conclusions they reach, and seek out more information. Denialists view the facts in front of them and choose to disbelieve the facts. Next to present was Cornelia “Cory” Dean, former science editor of the New York Times and a lecturer on engineering and applied sciences at Harvard University. Dean spoke about her experiences in science reporting, particularly around climate change. Dean discussed “predictable surprises,” or events that happened which could have been foreseen and prevented. She cited locks on cockpit doors to prevent against terrorism as an example. In the beginning, airline companies were concerned about the monetary costs for cockpit locks, but in the end, made the change after the 9/11 attacks. Dean also explained the problem of objectivity in science reporting. In the beginning, she said, news outlets offered both sides of a story to broaden the market of people they would reach so advertisers would fund their organizations. Now, reporters are required to tell both sides of any story, “even when the story only has one side” in terms of climate change. She said that the problem with media outlets like MSNBC and FOX don’t feel the need to give opposing sides, so that people are surrounded by ideas they are already familiar and in agreement with. “[We need to] bring in people locally in hopes they see other problems,” Dean said. Kenneth Kimmel, a lawyer, and President of the Union of Concerned Scientists spoke about larger corporations, like Exxon and Chevron, funded their own climate research, and chose to deceive the public and mass media about their findings. Kimmel explained that five to 10 years before climate science became widely talked about, fossil fuel companies did their own research through privately funding scientists. Finally, J. Timmons Roberts, Ittleson Professor of Environmental Studies and professor of sociology at Brown University, spoke about the technicalities of the 2015 Paris Climate Conference. Roberts said that large scale climate policies must be led by larger countries like the United States and China. Until we choose to act, smaller countries won’t see the need to enact climate protection policies, like cutting back carbon emissions. The panel discussion hosted several questions from the public, and from students as well. Some questions asked included, how do we act in an election year when thinking about climate change, Governor Gina Raimondo’s support of fracking in Burrillville, hydropower concerns about methane releases, and being proactive or reactive to problems. Before afternoon breakout sessions, URI President David Dooley introduced Whitehouse for the Keynote address. He spoke about getting people involved and invested in climate change. “Rhode Island is on the front lines of climate change,” Whitehouse said. He pledged to continue in his efforts in congress to support better climate change policies for the country. He chalked misinformation up to a “democracy problem,” and reminded people not to fall victim to “masquerade or talkshow” science, but instead to listen to facts and reason. Several protesters with the organization “Fossil Fuel Free Rhode Island” held up “Save Burrillville” signs during Whitehouse’s speech. The group was angry about a policy to allow fracking in the state, along with running a large pipeline through the town. Molly Hall, a doctoral student and professor in URI’s English department, helped organize the event. She said she thinks the conference went well overall, and was was proud of the large student turnout. “It shows that they are personally interested,” she said, adding that this is an important issue for young people to be invested in.